Infections like C. difficile are usually linked to a general imbalance of the intestinal microbiota, often referred to as dysbiosis. 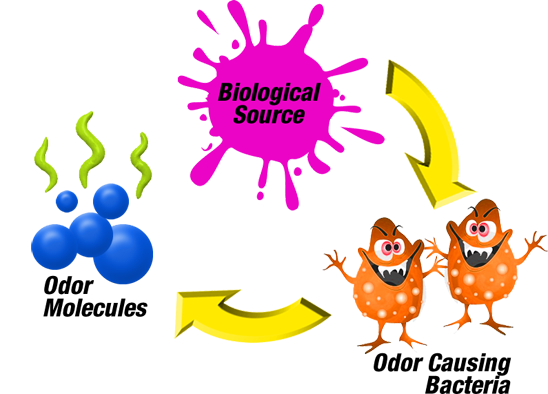 This means that the odors could be coming from several microbial species, hence could be different for different individuals. Does it mean odor-based diagnostics will never be enough specific? Not according to a 2-year-old beagle from Netherland, named Cliff. After just a little over two months of training, the beagle learned to identify the C. diff toxin by sniffing people or their samples. During one test, he was able to identify 25 out of 30 infected patients and 265 of 270 non-infected individuals. He also correctly identified 50 of 50 C. diff positive stool samples and 47 of 50 samples from people that did not have this infection. That's sensitivity of 100% for samples and 83-93% for sniffing the air around the patients, and a specificity of 94-100%! And it took him less than 10 minutes to accurately perform 300 diagnostic tests. Dogs already do the dirty work with detecting molds. They can examine an office building with 200 rooms in just 8 hours, a task that would take us several days of measuring moisture, probably without any result. Electronic noses would be of great help and many years of research are finally being translated into useful technologies - to be integrated with refrigerators and mobile phones. But until we are able to build smart devices to detect odors without labor-intensive dog training, perhaps we could train our own nozzles. Studies have shown we do get better with practice.